It’s the beginning of November and time for the monthly ArtSmart Roundtable in which several art history-loving travelers post on a theme. You can see links at the bottom to the other posts in the group. 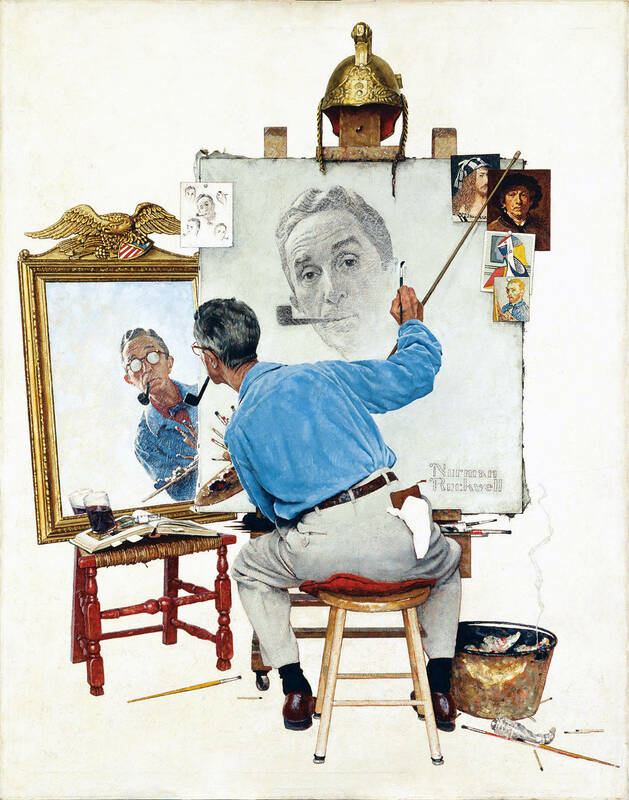 I’ve always loved portraiture, but for November’s ArtSmart Roundtable on art genre’s, I am going to focus on a special kind of portrait – the self-portrait. As I’ve pointed out before, when creating a portrait, the artist makes certain choices about how to depict the sitter with respect to social, economic and personality traits that go way beyond the physical representation of the sitter. 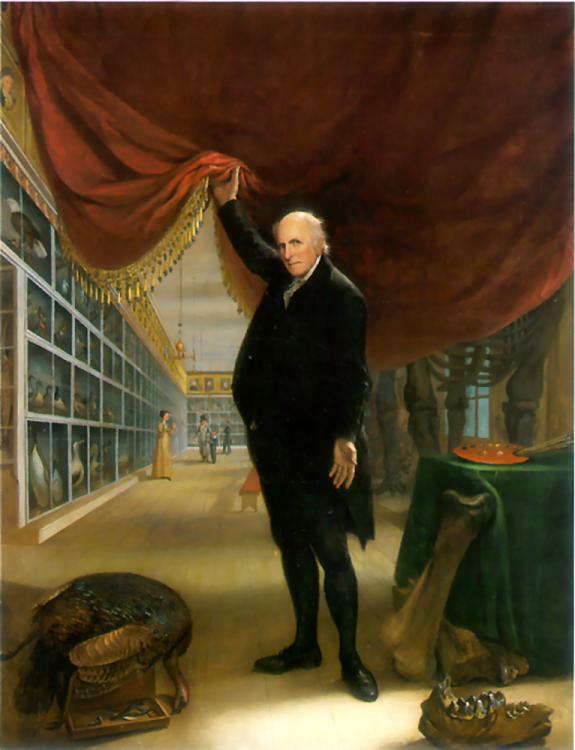 The final image has to reflect the subject’s own self-concept, the patron’s desires for the image and any opinions the artist has about the subject. These are difficult choices for the artist to balance, especially in many cases when trying to please whomever paid for the painting. A self-portrait is somewhat different. The artist is creating a likeness that she or he may be very familiar with – their own! Without a donor to please or often a purpose for the painting, the artist can make all the choices about the image and so his or her psychology and visual goals may come very clearly into focus. 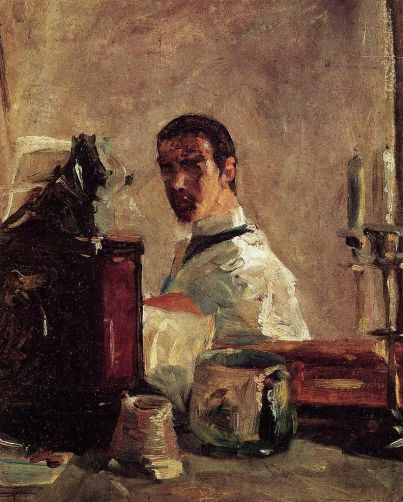 Self-portraits have always fascinated me because, while they may not be the most accurate physical representation of the artist, they are the most accurate depiction of who the artist thought he or she was. For large commissions or in an environment where one was considered a skilled laborer, signing a work as we know it today did not exist. I think it’s a natural human tendency to “claim” something one has made – both for pride in the achievement and to advertise yourself. 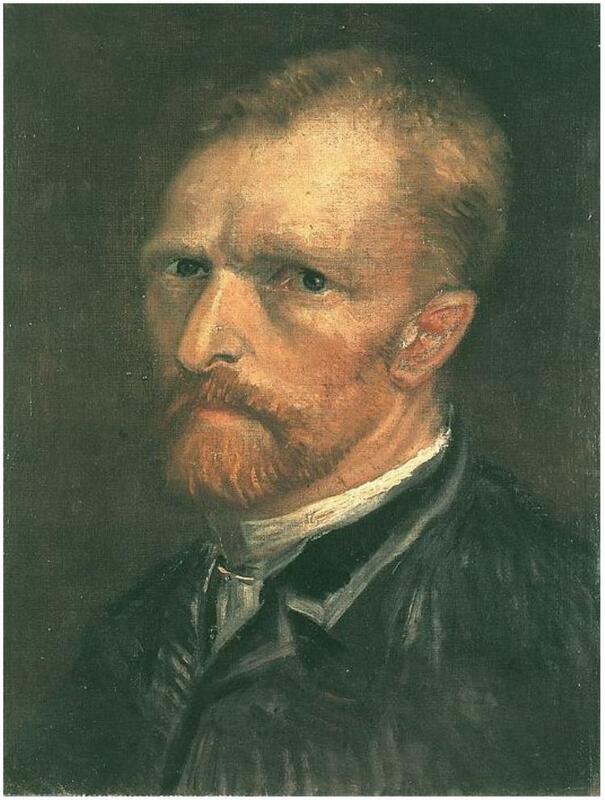 Perhaps unsurprisingly then, artists began incorporating themselves into their work. 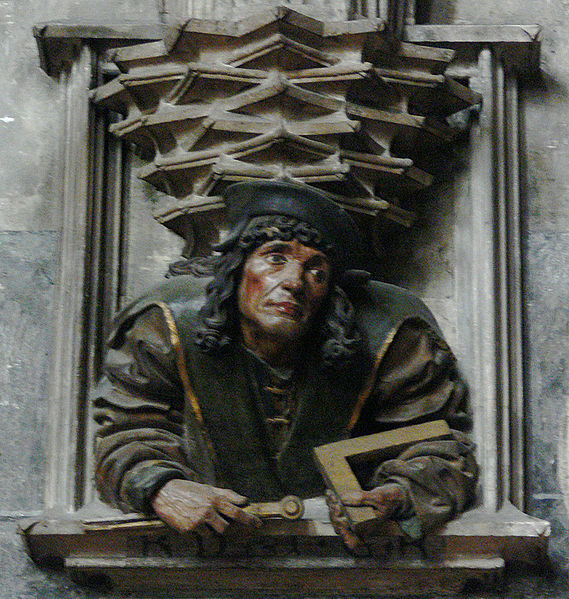 Hiding in plain sight, one decorative architectural element in the Cathedral of St. Stephen in Vienna depicts Anton Pilgram, an architect and sculptor, who helped create the interior of the cathedral. It’s easy enough to paint oneself into a crowd scene and you see that typically in Renaissance paintings. I’m interested in occasions where the artist paints themselves into a more active role or even into a uncomfortable position. The flayed skin of St Bartholomew in Michelangelo’s “Last Judgment” (1537-1541) is believe to be a self-portrait of Michelangelo himself. 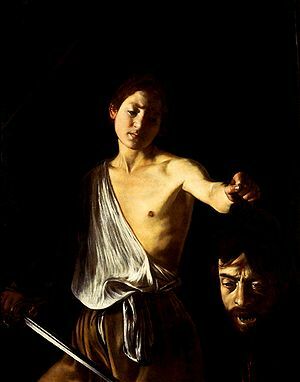 The open mouthed and blankly staring head held by a youthful David in Caravaggio’s “David with the Head of Goliath” is believe to be a self-portrait of the artist. The far right figure in Botticelli’s “Adoration of the Magi” is the artist himself. Interestingly, there was a tradition in large, group scene paintings such as this to have one figure face the viewer and essentially point to the action. (For example, the Virgin Mary in Masaccio’s famous “Holy Trinity”.) However, here Botticelli does not gesture toward the Virgin and Child but in fact looks somewhat inquisitively back at the viewer. What does this mean if the artist is allowed to look away from the Nativity scene? Perhaps, Botticelli was beginning to feel empowered by his commissions and achievements and was developing his ego – which leads me to self portrait category 2 below. Artists have long been considered craftsmen or skilled workers. It was the Renaissance that saw the emergence of the artist as an individual or as a respectable professional like the famous ancient Greek sculptors. While many artists struggled with how to assert themselves, a few created bold, stand alone self-portraits. 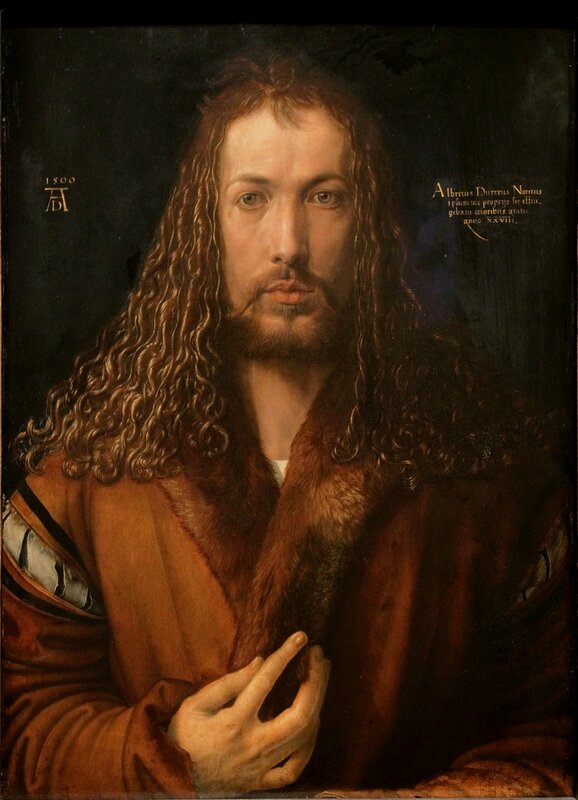 I have always liked Durer’s self-portraits for their directness, strength and the obvious reference to Christ in his 1500 AD portrait below. 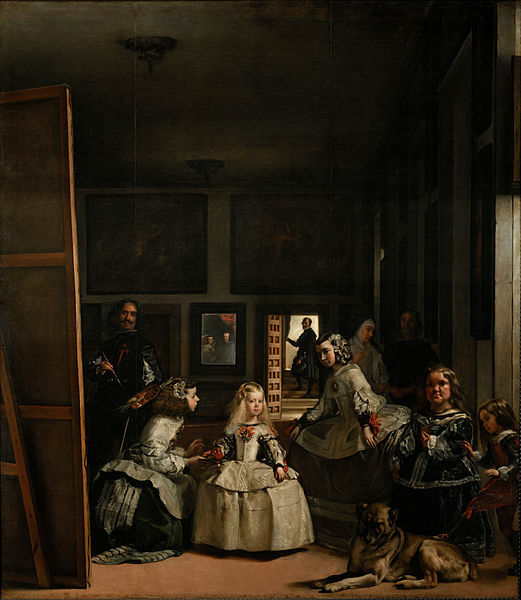 Velazquez’s “Las Meninas” is a masterwork with many interesting elements, but notably it also contains Velazquez’s self-portrait at the easel. Velazquez shows himself calmly in the presence of the King and Queen (albeit implicitly) who stand in the viewer’s position. By placing himself prominently into this intimate family scene, Velazquez is showing us how highly respected he was in the Spanish Hapsburg court and not just a servant to his patron King Philip IV. Many painters depict themselves with an easel, palette and brushes to declare their identity and status as professional artist. 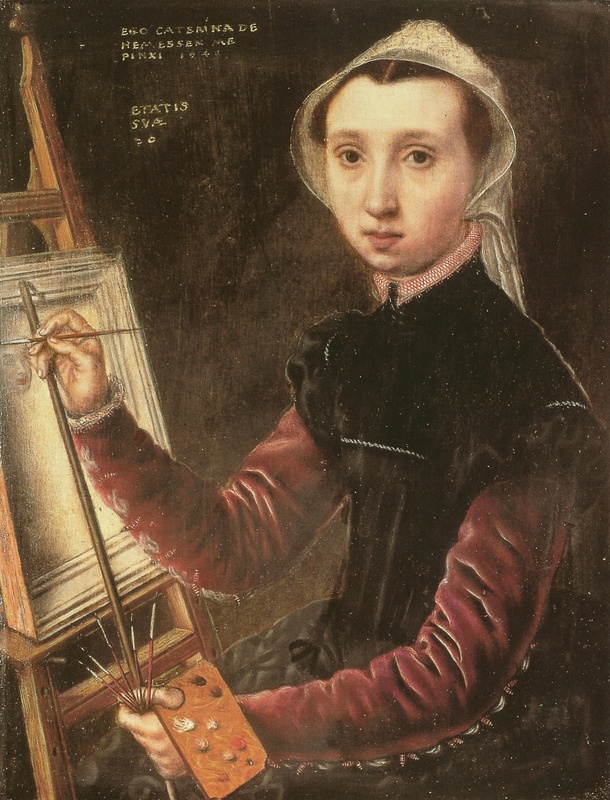 While male artists can switch back and forth between self-portraits with and without the “tools of the trade”, the majority of female artists, especially the early ones, included the instruments of artistic creativity in their self-portraits. While males had struggles to elevate the positions of artist from craftsman to creator, female artists sought legitimacy and recognition for their talents. They wanted to undeniable proof of this skill; I think this is why so many created their self portraits in the act of painting. It’s not uncommon for an artist to pick a theme and work through a series of related images – for example, Goya’s Caprichos and Monet’s waterlilies (or haystacks, or cathedrals, etc). For some artists, they themselves are the interesting theme. Rembrandt returned to his self-portrait 88 times in his career showing this youth or age in progressive images executed as sensitively as his commissioned portraits and religious figures. Andy Warhol used his own portrait like any other Pop Art subject matter. 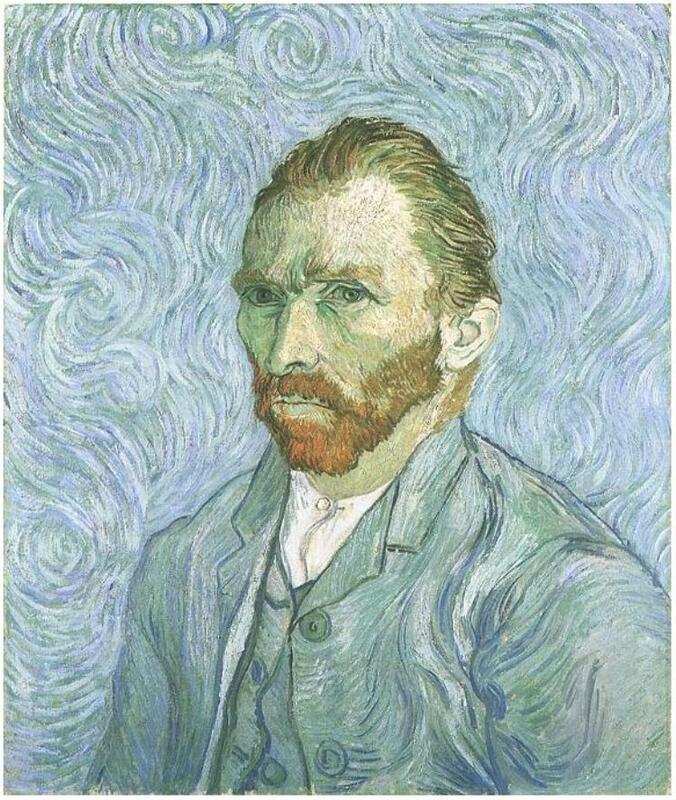 Vincent van Gogh turned inward creating 30 self-portraits in which he explored his increasingly expressive style. I think the greatest self-portrait painter was Frida Kahlo who worked with her own personal tragedies, physical pain and self-image almost exclusively. Painting from her own emotions and reality (or surreal reality of complex psychology and concepts), these works are uniquely powerful. I feel like I understand a great deal more about an artist as a person once I can see their self-portrait. It is often one of the first paintings I search for when exploring a new painter. Really an outstanding selection, Christina, a few I haven’t seen before. 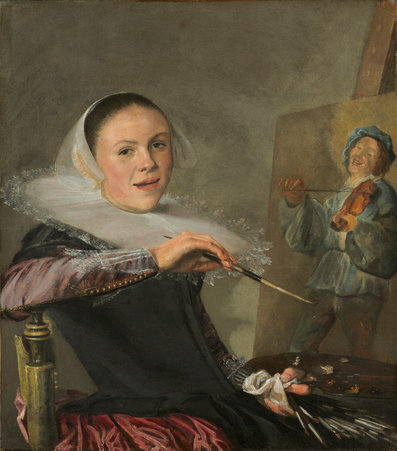 I am a big fan of Judith Leyster, so glad you included her! There is a major show on Frida Kahlo and Diego Rivera at the Art Gallery of Ontario right now. The show includes many photos of Frida, her Vogue covers plus a ‘home’ movie. The smiling, graceful, animated woman in that footage is very unlike her self portraits. Quite the eyeopener. Thanks Lesley! It was fun picking out images for this post. 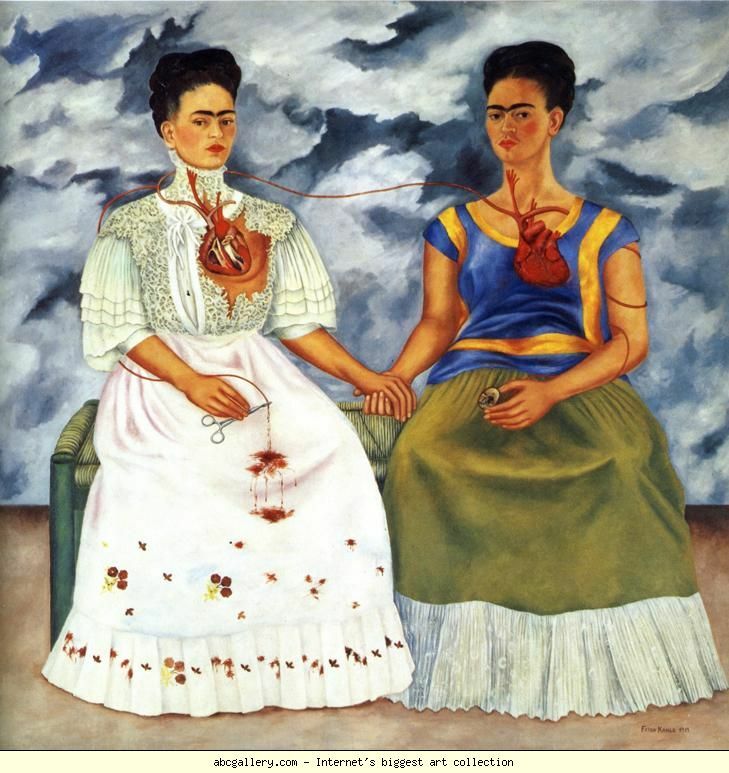 I didn’t know Ontario had such a great Frida and Diego exhibit right now – sounds trip-worthy! I LOVE the Durer self portrait. It was such a ballsy move, and it’s one that is burned into my brain as instantly recognizable. Rembrandt’s 88 self portraits…I really can’t think of another artist with so many self portraits!